What an amazing weather week! The stage was set with daily record rainfall amounts on Wednesday and Thursday as nearly 8" of rain fell on the city, creating flash flooding scenarios, filling tributaries, and saturating the ground. That was followed by additional rounds of rainfall to end the week that dropped varying amounts, but exacerbated the flooding problem since all rain became runoff. Estimated precipitation totals from March 8-10 courtesy NWS-Memphis. The wet period ended late Sunday evening with a potent upper level system and accompanying surface low passing through the region, bringing a round of severe storms that promoted Tornado Warnings in the metro. 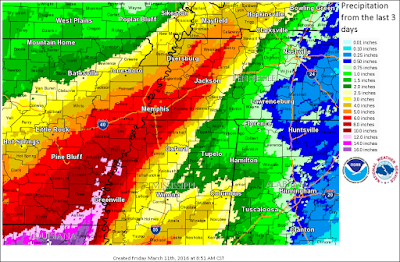 Officially, the Memphis airport received 10.61" of rain since last Tuesday night, which puts March 2016 in 5th place for wettest March on record - and it's only the 14th. Another 1.25" is all that is needed to become the wettest March on record. 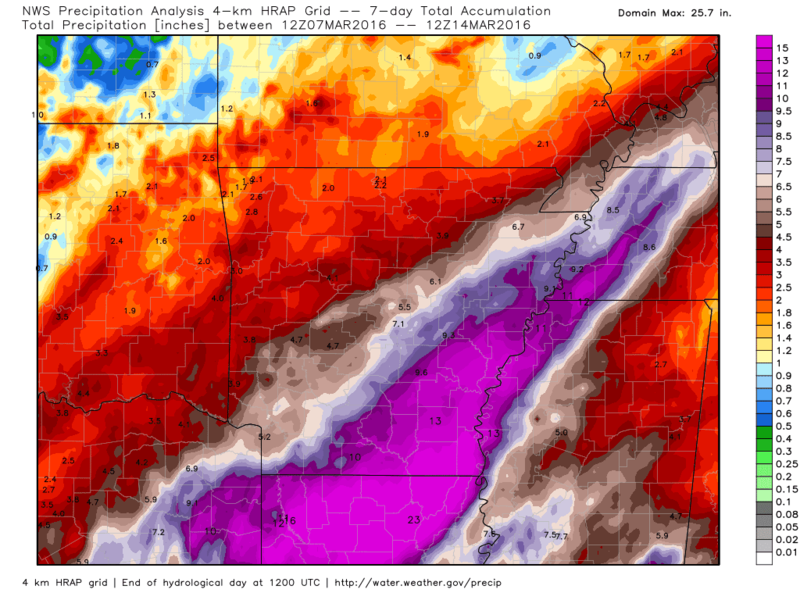 7-day rainfall amounts from the NWS show a swath of 10-12"+ amounts from northern Louisiana across southeast AR, and into the metro. Graphic courtesy WeatherBell. Fortunately the next several days are looking much drier. Despite a couple of opportunities for light precip, no heavy rainfall is expected. In fact, we'll be back up to 80 degrees tomorrow with mostly sunny skies after a pleasantly sunny day today that saw temps in the 70s. Slight chances of rain will occur Tuesday night with a cold frontal passage and again Wednesday night as a weak system slides by to our south. A general cooling trend is expected as we head towards the weekend with rain chances returning late Friday into Saturday, but no heavy rain expected. 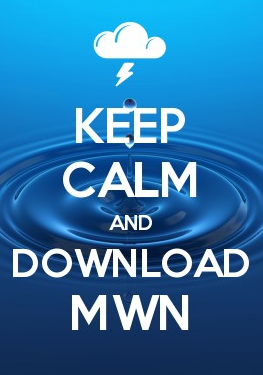 Click here for the latest forecast from MWN. 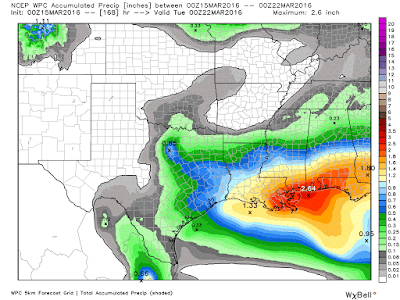 NWS forecast for precipitation amounts over the next week. No heavy rain is expected, though a few passing systems could bring light amounts. This forecast subject to revision. Graphic courtesy WeatherBell. In the wake of this past weekend's weather, I have a few comments to make and I'll keep them brief. I'm PROUD and GRATEFUL for the contributions of my #TeamMWN interns, past and present. Several months ago, my wife and I registered for an out-of-town retreat for this past weekend. There was no changing it, and we had a great time. But somebody had to keep you all up to date! Enter current interns Patrick and Zeb and former interns William and Kevin, who were pulled "off the shelf." All four of them were in various stages of spring break and/or travel plans of their own, but all committed time to MWN to keep the home fires burning! You were in good hands and I was able to preserve my marriage! LOL. Outstanding work, gentlemen. Thank you! I returned in time to nowcast the evening severe weather event with Patrick. In case you weren't aware, we typically tag-team big events to make sure everything is covered and you all get the info you need. Fortunately, lingering effects of a weekend of flu-like symptoms (no really, how great is that?) didn't keep me out of the game! Despite some serious-looking storms, an amazing light show, and a bunch more unneeded rain, we are fortunate there wasn't more damage. The storm that produced the warning had a history of producing a tornado, but had traveled over lightly-populated area as it approached the metro from the southwest. The National Weather Service had received no reports as the storm neared the metro despite a Tornado Warning being in effect and decent rotation being observed on radar. As it neared the southwest tip of the metro, the NWS opted for a Severe Thunderstorm Warning for northwest DeSoto County and the heart of Memphis and Shelby County as rotation had become fairly broad and there were no ground reports from the storm of damage. Shortly after issuing, an unconfirmed report of a funnel cloud was received in northwest DeSoto County. In an abundance of caution and with broad rotation, but no "tornadic signature," evident on radar, a Tornado Warning was issued for Southaven and much of the southern and central sections of Shelby County, including Memphis. With a storm that had a history of "nefarious behavior," a possible funnel reported, and a highly-populated area ahead of it - after dark - that was absolutely the right call. You simply can't make a mistake the other direction and not warn the public. Once the storm had traveled over some of that population center and no reports were received of damage, as well as the storm becoming less organized, it was also a good call to cancel the Tornado Warning early. Sirens... We had a "YUGE" (as Trump would say) number of questions on their sounding or not sounding when people thought they should/shouldn't. I've discussed the purpose of sirens before and regular readers and followers know you shouldn't count on them, especially indoors at night with pouring rain and wind. They are for outdoor use only. I'll make two points on their use. First, depending on where you live, the siren activation policy is different, even across Shelby County. Memphis and Shelby County (outside of Bartlett, Collierville and Germantown) currently sound for their entire area of responsibility if any part of Shelby County is under a warning. Bartlett, Collierville, and Germantown sound them if any part of their individual municipality is affected. Memphis was pursuing a more targeted siren policy some time ago, but so far that has not transpired. Second, the sirens are manually activated by the authorities in the respective jurisdictions, not by the NWS. That means that they are also DE-ACTIVATED manually. Sometimes it takes several minutes, especially if a warning is cancelled early, for that jurisdiction to shut down their sirens. It's not surprising then that sirens will still be sounding for a bit after a warning is cancelled. Thirdly, in general, many of the sirens will wail for a couple of minutes, stop for a couple minutes, then start back up again. This is because they use mechanical motors and running them for 30-60 minutes straight burns the motors up. To keep their lifespan high, the cycling is necessary. We have an Outdoor Siren Page on MWN that you may wish to visit.